The US military has built a stone circle in its Air Force academy to give pagans, druids and witches somewhere to practice their religion. The Colorado base has spent around £50,000 building the Stonehenge-like structure to allow witches to cast spells, and pagans to form “circles of power” by night. it is situated on top of a wooded hill and includes a fire pit. The academy says it is for cadets who practice ‘Earth based’ religions including druids, witches and North American faiths. Despite the expenses it is believed only three out of the 4,300 cadets have openly admitted that they are pagan. “Most Wiccan groups also practise magic, by which they mean the direction and use of ‘psychic energy’ — those natural but invisible forces which surround all living things,” it explains. The air force says the site is to help to protect the constitutional right to religious freedom. But some think it is an attempt to attract more Wiccans to the army. “Many men attracted to wicca are also attracted to this fantasy of the ancient warrior who is spiritually adept, but also a great fighter,” Margot Adler, a renowned witch and broadcaster, said. 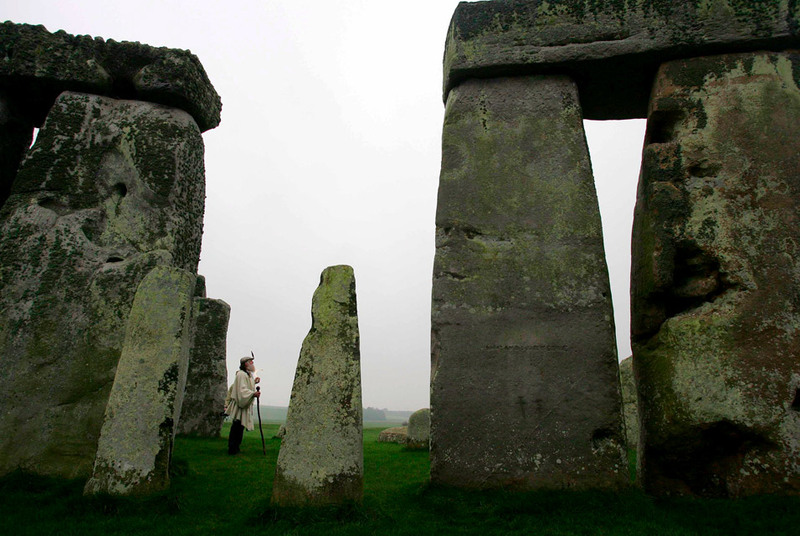 Calls for Stonehenge to be lit up at night to capitalise on its appeal have been resisted by experts who claim it would spoil enjoyment of the prehistoric Wiltshire monument. After years of little progress, a multi-million-pound development plan was recently adopted to improve the site, which abuts the busy A303. 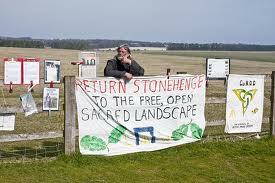 However, some people believe more could be done to ensure that Stonehenge can be appreciated around the clock. They suggest the ancient stone circle could be lit at night “like the pyramids in Egypt or Castel Sant’Angelo in Rome”. The discussion became a national debate when Lady Mimi Pakenham, of Warminster, in Wiltshire, raised it in a newspaper. She said: “The magic of Stonehenge could be shared every evening with all who pass, many of whom can’t afford a ticket, just as it was a magical place thousands of years ago, sometimes with the Moon and clouds shining as well. With subtle lighting sunk well out of view and endless possibilities of solar energy, the monumental power of ancient man’s achievement in another age would inspire all who pass by. 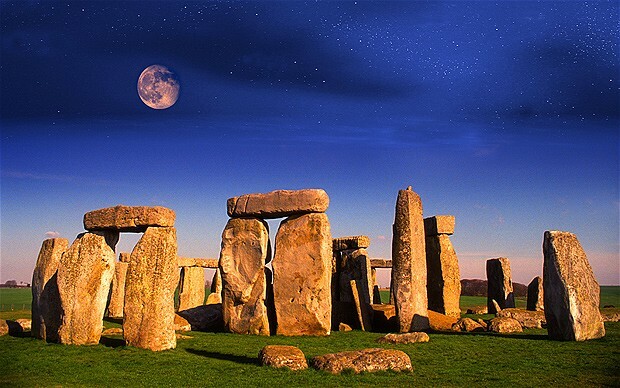 Clive Ruggles, a professor of archaeoastronomy – the study of how ancient cultures understood the sky, said seeing Stonehenge alongside the stars was a key part of its appeal. 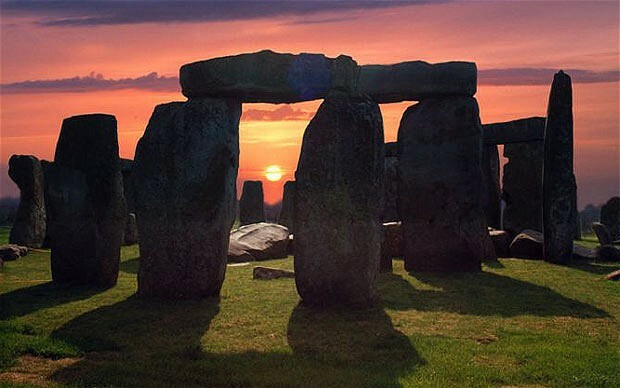 He said: “Stonehenge is iconic of the connections between ancient monuments and the sky, not only with strong connections to the annual cycles of the Sun but also very likely to the Moon and stars. A number of groups, including the Royal Astronomical Society and the International Astronomical Union, have been working alongside English Heritage for several years to try to preserve as dark a night sky as possible in the area. They have also been exploring ways in which “night tourism” might be permitted and encouraged in the future, Prof Ruggles said. However, the debate is likely to only make the ongoing struggle to acceptably improve the site more knotted. BIRMINGHAM.- Archaeologists led by the University of Birmingham with the Ludwig Boltzmann Institute for Archaeological Prospection have discovered evidence of two huge pits positioned on celestial alignment at Stonehenge. Shedding new light on the significant association of the monument with the sun, these pits may have contained tall stones, wooden posts or even fires to mark its rising and setting and could have defined a processional route used by agriculturalists to celebrate the passage of the sun across the sky at the summer solstice. 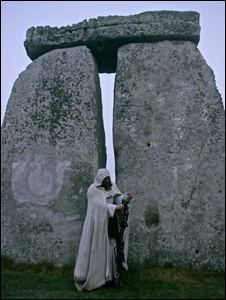 photograph showing Arch Druid Keeper of the Stones Terry Dobney inspecting the famous British landmark Stonehenge in Wiltshire, south west England. Professor Vince Gaffney, archaeologist and project leader from the IBM Visual and Spatial Technology Centre at the University of Birmingham, explains: “This is the first time we have seen anything quite like this at Stonehenge and it provides a more sophisticated insight into how rituals may have taken place within the Cursus and the wider landscape. These exciting finds indicate that even though Stonehenge was ultimately the most important monument in the landscape, it may at times not have been the only, or most important, ritual focus and the area of Stonehenge may have become significant as a sacred site at a much earlier date. 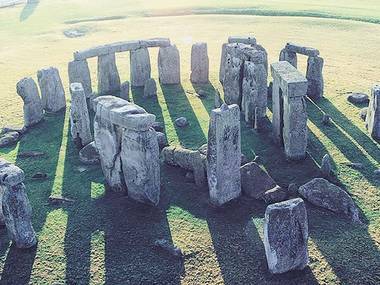 Extraordinary new discoveries are shedding new light on why Britain’s most famous ancient site, Stonehenge, was built – and when. 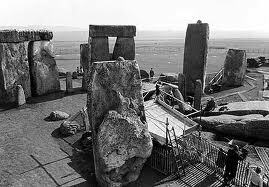 Current research is now suggesting that Stonehenge may already have been an important sacred site at least 500 years before the first Stone circle was erected – and that the sanctity of its location may have determined the layout of key aspects of the surrounding sacred landscape. The investigations have also enabled archaeologists to putatively reconstruct the detailed route of a possible religious procession or other ritual event which they suspect may have taken place annually to the north of Stonehenge. That putative pre-historic religious ‘procession’ (or, more specifically, the evidence suggesting its route) has implications for understanding Stonehenge’s prehistoric religious function – and suggests that the significance of the site Stonehenge now occupies emerged earlier than has previously been appreciated. The crucial new archaeological evidence was discovered during on-going survey work around Stonehenge in which archaeologists have been ‘x-raying’ the ground, using ground-penetrating radar and other geophysical investigative techniques. As the archaeological team from Birmingham and Vienna were using these high-tech systems to map the interior of a major prehistoric enclosure (the so-called ‘Cursus’) near Stonehenge, they discovered two great pits, one towards the enclosure’s eastern end, the other nearer its western end. When they modelled the relationship between these newly-discovered Cursus pits and Stonehenge on their computer system, they realised that, viewed from the so-called ‘Heel Stone’ at Stonehenge, the pits were aligned with sunrise and sunset on the longest day of the year – the summer solstice (midsummer’s day). The chances of those two alignments being purely coincidental are extremely low. The archaeologists then began to speculate as to what sort of ritual or ceremonial activity might have been carried out at and between the two pits. In many areas of the world, ancient religious and other ceremonies sometimes involved ceremonially processing round the perimeters of monuments. The archaeologists therefore thought it possible that the prehistoric celebrants at the Cursus might have perambulated between the two pits by processing around the perimeter of the Cursus. Initially this was pure speculation – but then it was realized that there was, potentially a way of trying to test the idea. On midsummer’s day there are in fact three key alignments – not just sunrise and sunset, but also midday (the highest point the sun reaches in its annual cycle). For at noon the key alignment should be due south. One way to test the ‘procession’ theory (or at least its route) was for the archaeologists to demonstrate that the midway point on that route had indeed a special relationship with Stonehenge (just as the two pits – the start and end point of the route – had). The ‘eureka moment’ came when the computer calculations revealed that the midway point (the noon point) on the route aligned directly with the centre of Stonehenge, which was precisely due south. This realization that the sun hovering over the site of Stonehenge at its highest point in the year appears to have been of great importance to prehistoric people, is itself of potential significance. For it suggests that the site’s association with the veneration of the sun was perhaps even greater than previously realized. But the discovery of the Cursus pits, the discovery of the solar alignments and of the putative ‘processional’ route, reveals something else as well – something that could potentially turn the accepted chronology of the Stonehenge landscape on its head. For decades, modern archaeology has held that Stonehenge was a relative latecomer to the area – and that the other large monument in that landscape – the Cursus – pre-dated it by up to 500 years. The argument for this is simple, yet persuasive. Because the ‘due south’ noon alignment of the ‘procession’ route’s mid-point could not occur if the Cursus itself had different dimensions, the design of that monument has to have been conceived specifically to attain that mid-point alignment with the centre of Stonehenge. What’s more, if that is so, the Stonehenge Heel Stone location had to have been of ritual significance before the Cursus pits were dug (because their alignments are as perceived specifically from the Heel Stone). Those two facts, when taken together, therefore imply that the site, later occupied by the stones of Stonehenge, was already sacred before construction work began on the Cursus. Unless the midday alignment is a pure coincidence (which is unlikely), it would imply that the Stonehenge site’s sacred status is at least 500 years older than previously thought – a fact which raises an intriguing possibility. For 45 years ago, archaeologists found an 8000 BC Mesolithic (‘Middle’ Stone Age) ritual site in what is now Stonehenge’s car park. The five thousand year gap between that Mesolithic sacred site and Stonehenge itself meant that most archaeologists thought that ‘sacred’ continuity between the two was inherently unlikely. But, with the new discoveries, the time gap has potentially narrowed. Indeed, it’s not known for how long the site of Stonehenge was sacred prior to the construction of the Cursus. So, very long term traditions of geographical sanctity in relation to Britain’s and the world’s best known ancient monument, may now need to be considered. The University of Birmingham Stonehenge area survey – the largest of its type ever carried out anywhere in the world – will take a further two years to complete, says Professor Vince Gaffney, the director the project. Virtually every square meter in a five square mile area surrounding the world most famous pre-historic monument will be examined geophysically to a depth of up to two metres, he says. It’s anticipated that dozens, potentially hundreds of previously unknown sites will be discovered as a result of the operation. The ongoing discoveries in Stonehenge’s sacred prehistoric landscape – being made by Birmingham’s archaeologists and colleagues from the University of Vienna’s Ludwig Boltzmann Institute – are expected to transform scholars’ understanding of the famous monument’s origins, history and meaning. After many tens of years of investigation, the meaning behind the ancient monument of Stonehenge may finally have been discovered. Professor Mike Smith and his Oxford University team have concluded that the stones are not the final construction but just the scaffolding to allow work to take place. ‘We will never be fully sure as to why the Stonehenge hill was not completed but it is likely to have been an early impact of the current government funding cuts’ he concluded. Professor Smith’s roof has still not been fixed. A PLANNING inspector has ruled that byways surrounding Stonehenge will remain open. The decision follows inquiries into proposals to close the byways as well as parts of the A344 and the inspector has decided that although the road will close, the byways should remain open. English Heritage plans to return the area to grass as part of plans for a new visitors’ centre at Airman’s Corner. Planning inspector Alan Boyland said: “I accept that Wiltshire has a considerably greater length of byways than any other county. This is not however, in itself, a reason for allowing a further loss for recreational motor vehicle users. At the inquiry, Druid leader King Arthur Pendragon objected to the proposals to close the byways as he said it is a violation of his human rights not to be able to access the area, particularly during Pagan ceremonies such as celebrations of the solstices and equinox. The new visitor centre has got planning permission and despite funding problems English Heritage hopes the it can be completed by 2013. Recent Analytical survey and investigation in the World Heritage Site, by David Field. Monuments within the Stonehenge Landscape have rarely been subject to survey techniques in modern times and in many cases reliance has been placed on Ordnance Survey depictions of the early 20th century. In advance of the establishment of a new visitor centre and to complement and support the recent university programmes of excavation in the area, English Heritage has been conducting the Stonehenge WHS Landscape Project to determine what non-destructive survey techniques can tell us about the area. Using ground survey, aerial photography, lidar and laser scanning a number of fresh and sometimes surprising conclusions emerge. This talk will outline the results so far. David Field is a senior landscape archaeologist at English Heritage. He has undertaken extensive research into the prehistory of Salisbury Plain and the Vale of Pewsey, including the Stonehenge World Heritage Site. Publications include ‘Earthen Long Barrows’ 2006),‘The story of Silbury Hill’ (co author with Jim Leary, 2010), ‘The Field Archaeology of the Salisbury Plain Training Area’ (2002) and ‘Ancient water management on Salisbury Plain’ in Patterns of the Past: Essays in Landscape Archaeology (1999). He has also contributed a number of articles to WANHM, most recently as one of the joint authors of the reports on the Breamore jadeite axehead and the Late Bronze Age and Early Iron Age Midden at East Chisenbury, in Volume 103 (2010). Saturday afternoon lectures start at 2.30pm and last approx. one hour.